This is not how I wanted my wish to come true. Ths is not how I would have chosen to become a quadrangle. I would far, far rather still be a triangle if it meant that my mom was alive. But since that is a scientific impossibility, I am trying to look on the bright side. I have always waned a sister. And I'm about to get one. It was like being in my own private horror movie. It was my house, yet it wasn't my house. It was my life, yet it wasn't my life. I decided to pick this book up mainly because an author friend of mine whom I respect and adore wrote this on her Facebook page: "I think tearing up on PAGE 2 of a book has to be a record for me. Seriously, from a smile to a gasp in like 200 or so words is not what normally happens to me at the beginning of reading a book. But yeah, these last 24 or so hours have been filled with those moments." And because I am a sucker for emotionally gutting stories and I always trust Joanne Levy's opinions, I immediately reached for my copy of We Are All Made of Molecules. Joanne wasn't lying or exaggerating when she said this book made her cry (and on page 2!). I experienced the exact same thing. And even though I already knew I should brace myself for waterworks, I still cried. I think I even sobbed a bit. I mean, the way that opening scene was written totally got to me. Being a mom of a 16 month old baby girl, I tend to get ridiculously emotional about anything family-related, baby-related, mom-related and especially loss-related (and yes, that also includes Sarah Mclachlan and her SPCA tear-jerkers). Of course, not everyone will feel the same about the opening chapter, but if you're anything like me - soft on the inside and slightly hormonal - be sure to have a box of tissues handy. 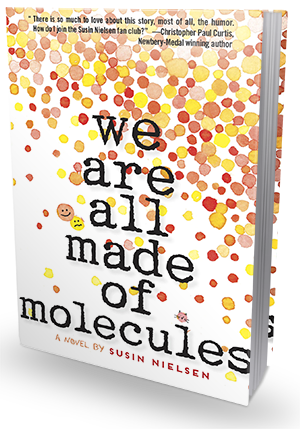 We Are All Made of Molecules tells a story of a family torn apart by illness and death and stitched back together with a delicate and fragile thread of hope, new beginnings and love. Stewart's mom died from cancer two years ago and his entire life pretty much fell apart. Both Stewart and his father are still in pain because of that, but it is time to move on. Stewart's dad had found and a new partner and they are moving in with her and her daughter. New beginnings are never easy and this one is looking particularly tough for all parties involved. Stewart is 13 years old and he is very intellectually gifted. Unfortunately, his social skills are lacking and he simply doesn't know how to go about making new friends. That proves particularly problematic when he's faced with moving to a new place, going to a new school and living with a 14 year old girl who seems to hate him from the get-go (and for no reason at all). Ashley is a bratty teenager with a mean streak and plenty of attitude. She hates having to live with her mom's new boyfriend and his "freakazoid" son and she makes it very clear every chance she gets. She's downright rude and unnecessarily cruel, and I really did not like her at all, even though I kind of understand where she was coming from. After all, her own life wasn't exactly perfect. Still, there are worse things that could happen than your dad announcing he is gay and it doesn't excuse her drama-queen attitude, snobbish behavior and disrespecting her parents. That being said, I do think both Stewart and Ashley were very realistically portrayed, with all the character flaws, quirks and annoying tendencies appropriate for young teenagers in a very challenging and emotional situation. I thought Susin did an outstanding job showing the emotional torment of the kids, as well as the struggles of their parents. 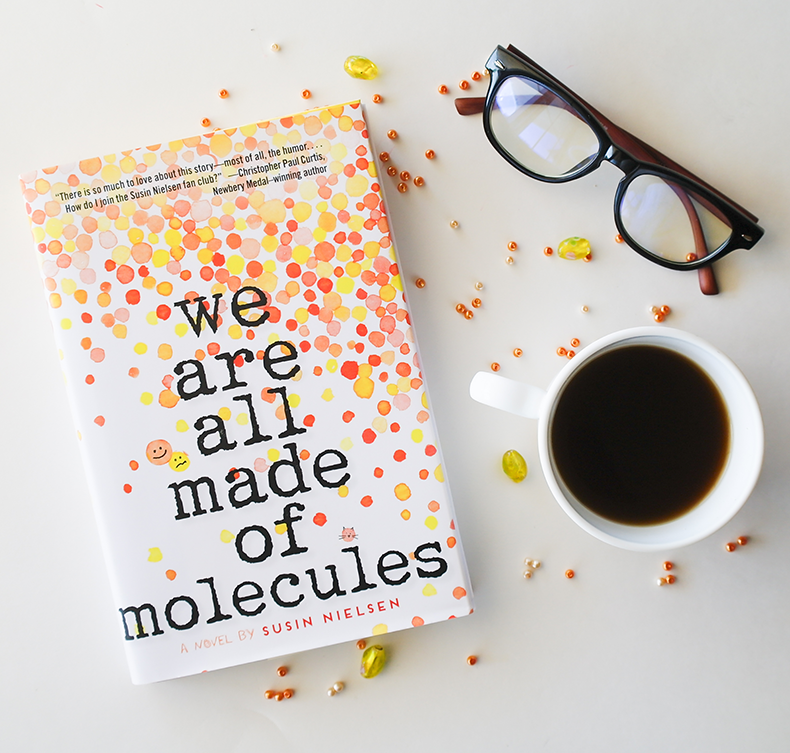 We Are All Made of Molecules is a beautiful, engaging and meaningful tale about two fractured families being blended into one whole one again. The beginnings are never easy - heck, they are scary and intimidating and seemingly disastrous - but in the end, love wins. The message here is clear and powerful, and delivered in a very convincing, thoughtful way. I really loved this book and would recommend it to anyone who enjoys heartfelt contemporary fiction dealing with difficult (but very important) themes. Thanks to Aisha and Random House Kids, we have two beautiful finished copies up for grabs today! Open to US only, ends 7/15!